A child petrified by the shadows in his bedroom. A boy shrinking from the anger of his father. A wandering adolescent who sees the Twin Towers as the legs of an interplanetary god. A new adult battered by the absence of that god. Burdened by the weight of the past and the uncertainty of the future, Jeremiah sets out in search of the answers to his own mysteries, embarking on a journey that will carry him from the raves of New York to the Latin tropics to Israel’s Independence Hall, and back to an autumn evening in Sheep Meadow when the world was still whole. A story of fathers and sons, self and shadows, Jeremiah’s Ghost traces the path of a young man through a landscape where memory is just another kind of fiction. 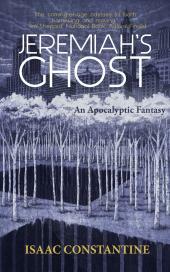 An Apocalyptic Fantasy is right: the hero of Jeremiah’s Ghost is as haunted and given over to intensities and anguish as one of H. P. Lovecraft’s protagonists, though pursued by inner rather than supernatural demons. Careening between the grandiose and the abject, he tries writing, women, travel, and drugs as his obsessive means of coming to terms with his own rage and sense of having been emotionally abused in this coming-of-age odyssey that’s both harrowing and moving. Isaac Constantine gracefully juggles the contradictions and inconsistencies that make us human. His protagonist, Jeremiah, is edgy and dark, innocent and jaded, adrift in a search for his place in the world. This debut novel is poignant and beautifully told. Constantine courageously explores how we view our history, blending the familiar with a broader historical context. He artfully invites an examination of identity, of what what it is to be wounded and to recover both self and community through a mystical journey of mind, body and spirit. Political yet personal, Constantine speaks with the tongue of metaphor and allows us to live in the border towns of unraveling clarity, with insightful wry humor sharpened by the skill and grace of a poet. Jeremiah's Ghost dares to pose questions that are rarely tolerated. But Constantine has the rare voice that dares to invoke a way to heal ourselves of our Ghosts.